It took Nomasomi two years to come to terms with her status, and to realise that she must act to save her health. By this time she had contracted TB and her CD4 count had dropped to just 7. She started taking ARVs and her health began to improve. However, she was still unable to disclose to her mother, and told her that the medication she was taking was for high blood pressure. In 2007, Nomasomi finally disclosed her HIV status to her mother, who found the news very difficult to accept. However, she has now come to terms with the HIV status of her daughter. Nomasomi disclosed her status to her sons last year, and was surprised at their different reactions. One son accepted her, saying “you are still my Mummy, and I still love you.” However the other son was very angry at his father, the man he had never known who infected his mother, but has now also accepted his mother’s HIV status. Nomasomi is now open about her HIV status with everyone, including her colleagues at the pharmacy where she works. 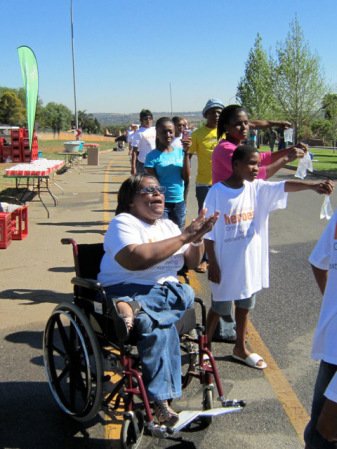 She says, “I can now talk about HIV at my workplace.” However, there continues to be a huge number of HIV positive people with disabilities who are frightened to be open about their status, because of the double stigma surrounding HIV and disability.